We are Sandra and Chris and we are traveling with our Standard Poodle named James. We arrived on a Sunday at 4pm and there was a creekside site still available. We must have been lucky because other days we saw the "no vacancy" sign get put out as early at noon. The campground is beautiful and quiet. There are quite a few sites that back up to the creek. The interior sites are all wooded and beautiful, too. We loved hiking across the rock bridge over the creek and up the mountain. We were told the trail leads into town behind the bath houses but we didn't go quite that far. The bathrooms are simple and don't have showers or hand soap. It is about 10 minutes to town where the shops and bath houses are located. It was nice being just far enough away from town in the quiet valley. Hot Springs is a little rough around the edges but we are still glad we visited. The promenade walk behind the bath houses was our favorite part of town. We camped at Gulpha Gorge Campground (NPS Campground) in a Travel Trailer. The park is gravel and our site wasn't level. The wifi didn't work at all. There is a big field across the street for walking your dog and we loved that. There is great BBQ just down the street at Commissary. The people that work at the park are very nice. There is a hall next door for parties and events. The music was quite loud on Saturday night but I can sleep through a train going by so I didn't mind. The best thing is the location - you feel safe, you are close to shopping and it is a short drive into Memphis. 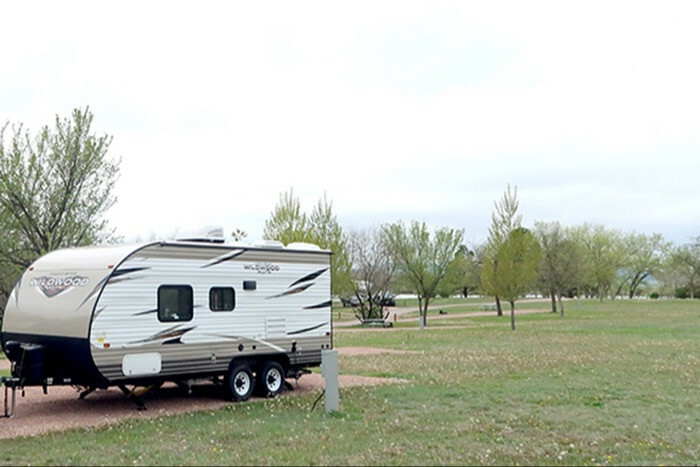 We camped at Agricenter International RV Park in a Travel Trailer. This campground is huge and it is very family friendly. There are kids everywhere! We didn't have a reservation and we were able to get the last available spot on the lake in the newer section on a Saturday afternoon. There are many sections - some are waterfront with water and electric and others are full hookups on inner loops or on the waterfront. The newest section has 50/30 and nice big wide and level pads. The older sections have concrete pads but they are just wide enough for your camper and many don't look level. There are many bathhouses. The laundry room was clean and $1 per wash and $1 to dry. The only downside is the Wifi. It looks like they spent a lot of money setting up antennas and repeaters but if you can even connect (and that is rare) the download speeds are slower than 1mbps. We work on the road so this was disappointing. Luckily we had good Verizon and ATT service and tethered to work on our laptops. I do think the reservation system needs updated or reworked. We were told we got the last spot but 70% of the sites around us were empty while we were there. 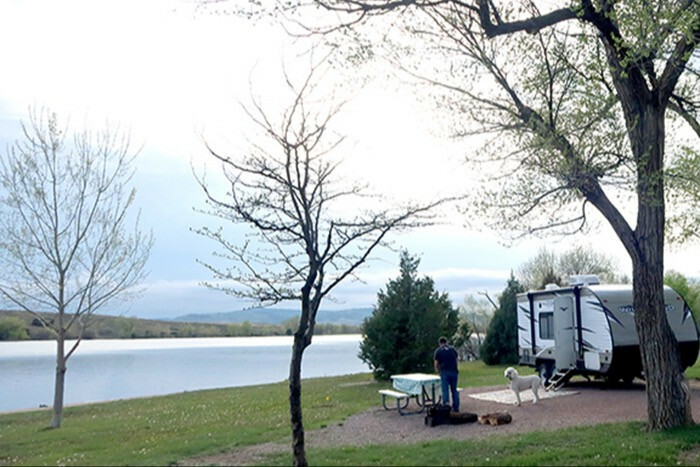 We camped at Wind Creek State Park in a Travel Trailer. This is a nice little campground outside of Tallahassee. The views and peace and quiet were perfect. The bathhouse isn't the nicest but it does the job. There is a Dollar General just down the road and if you need more shopping, Tallahassee is about 25 minutes away. There is wifi close to the main road and you can sometimes pick it up at your waterfront site - I was impressed! 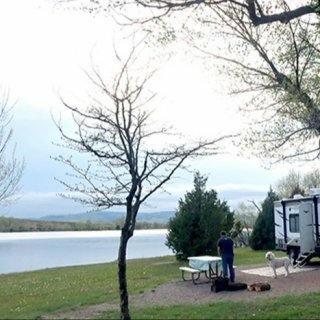 We camped at Coe Landing in a Travel Trailer. We love this campground! The concrete pads are nice and big (bigger on the east side of the office) but keep in mind you do need to bring a step if you pick one of the east side sites. They lean down towards the beach and once you prop your RV up to level it, you are left with quite a gap between the ground and your first step. 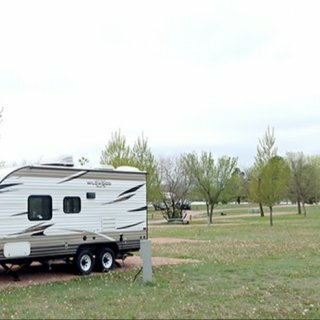 Many RVs here must be seasonal regulars and they have custom steps for this purpose. Just across the road is the public beach and it is so pretty. We love walking down to the point (about a 15-20 minute walk) with our dog. The Wifi is very slow and sometimes just doesn't work at all. This is the only downside - if they could fix the Wifi, we would stay for a month next time! But since we work from the road, we had to use our ATT and Verizon for internet. I did have a Tmobile card and it worked but if you head over to the other side of Carrabelle Tmobile turns to no service. The office staff is so nice. The grounds are beautifully landscaped with palm trees and flowering bushes. The bathroom is very clean. There is a community room where the ladies meet up to sew quilts and they have parties from time to time, too. We camped at Carrabelle Beach RV Resort in a Travel Trailer. We arrived on a Sunday around 2pm and only two spots were available. One was too small for our 23' travel trailer so we had to take the other spot. The sites are difficult to get in to - tight turns, trees, sign posts and soft sand. The bath houses were nice and clean for a county park. The park was very quiet and we enjoyed hearing the owls from time to time. It seemed like a lot of people were here long-term. If you can get a spot on the water, you would be very lucky! A few sites overlook the river. There is a canoe launch area and also a swimming area. We camped at Lithia Springs Park in a Travel Trailer. The neighborhood seems a little dicey when you first arrive but after you settle in it is fine. You are packed in like sardines but you have a nice little patio made of pavers. We felt safe and they have lots of security cameras. There is a Walmart across the street. The bathroom is nice. The laundry room is nice. It is a great central location for the Miami area - we were visiting family to the north, the south and out by the beach and the drive in all directions was easy. Go to Miami Subs just south of the campground - it is yummy fast food! You pay extra for the Wifi and we couldn't ever get it to work so we gave up and used our phones as hot spots. We camped at Hollywood KOA in a Travel Trailer. Our site was a dirt site - I would recommend getting a concrete pad site. At the lowest part of our site it was quite muddy and there was a drain on our site. We were careful not to park on it once we disconnected. The sites are super close together (like most KOAs). We couldn't get the Wifi to work. We loved sitting on the dock and just watching the lake. The palm trees and landscaping is really pretty and you have a lot of birds. The laundry room was really nice and the bathrooms were nice, too. We had friends stop by that were interested in buying an RV and they wanted to see our rig. They had to pay a $5 per person guest fee and that was just an uncomfortable situation. It wasn't like they were using the pool or showers - they just wanted to see what RVing is like. 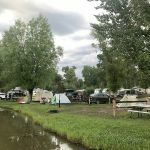 We camped at Orlando SE / Lake Whippoorwill KOA in a Travel Trailer. There is a Walmart practically across the street and a Publix just down the road. Orlando has toll roads for all of the major roads so do bring a lot of coins if you are heading here. You really can't get anywhere without getting on a toll road. The sites are sandy and spacious. We loved the trees covering our site - we felt like we were in a little nook. The wifi is only at the main office so we used our Tmobile and Verizon to get work done at our site. The beach is just across the street and it is dog friendly. The bathrooms are large and clean. I loved the meeting room where the ladies would meet up to sew and chat. We camped at North Beach Camp Resort in a Travel Trailer. This campground was a nice surprise! We had a spot close to the beach path. There used to be a lot of sites on the beach but as other reviewers have mentioned, those were washed away with the hurricane. The bathrooms were clean and the showers were nice. The beach felt private because it was really only other campers on this section of the beach. The campground store was really big and it had a lot of stuff. The town of Beaufort was so charming. There was a Publix in town and a nice Walmart. We had no cell service with Tmobile but the ranger station had wifi if we needed to make a phone call. Sometimes you could pick up a bar or two of the wifi on the beach but not at our site. We camped at Hunting Island State Park in a Travel Trailer. We were here when there wasn't an event so it was quiet and empty. The sites are gravel and clean. The walk to the bathroom is quite long - you probably want to drive over there instead. The bathroom was HUGE and clean. Shopping was just down the road. We would stay here again. We camped at Camping World Racing Resort (formerly Charlotte Motor Speedway CG) in a Travel Trailer. 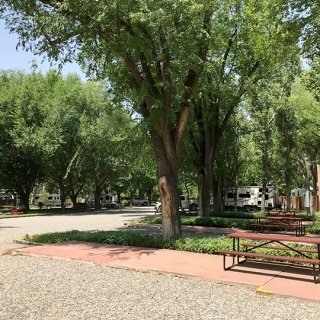 We were able to book a somewhat shaded spot for two weeks that backed up to the campground's entrance. I highly recommend asking for a site with some shade if you are traveling in the summer. The grass behind our site was perfect for playing frisbee. We also put our chairs at the back of our camper and sat outside in the evenings watching the sunset and watching other campers come and go. The wifi was fast. A lot of campers live there full time and they didn't really want to chat. There are two pools - a family pool and an adults pool. We really enjoyed the pool! There is Friday night entertainment in the ballroom - we didn't go but we walked by on the way to the pool and it seemed like a lot of fun! It is an easy drive to the Strip, a nearby mall and many other shopping and fun things to do. We loved eating at Lazy Dog at the mall with our dog (they even have a dog food menu). There are a few spots - 8 maybe - that back up to the pool. These are shaded spots with nice grassy yards overlooking the pool. If you can get one of those spots I would recommend it! 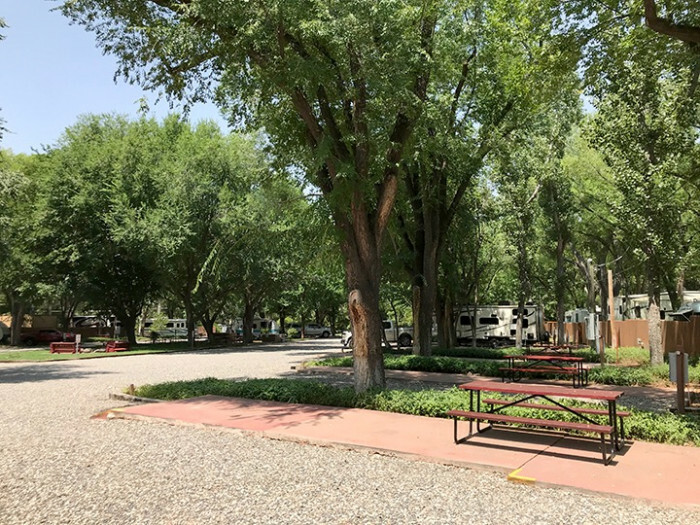 There are lots of bathrooms and laundry rooms throughout the campground. The one closest to us had a few quirks - two bathrooms had AC units and they were freezing. The others didn't have AC units and they were hot. There is a nice mini-golf course around the office and there are bocce ball courts in the middle of the campground. We camped at Oasis Las Vegas RV Resort in a Travel Trailer. The sewer hookup was close to the middle of the site and we did need to buy an extension sewer hose - they sell them in the office. We noticed almost every RV had an extension sewer hose. We booked last minute and could only get a full sun site that was tricky to back into. But it turned out to be fine - we had morning and afternoon shade. We only needed to put our awning out in the middle of the day. Most of the sites are full shade and the summer temperatures were wonderful in the shade. The Wifi worked great. We had fun playing in the creek at the campground with our dog. Everyone that works at the campground is very nice and they all seemed to know our dog's name and said hi to him which was very sweet. You can walk up to town - it takes about 15 minutes. You can also drive and park for free behind a lot of the shops. One of our only complaints is they could probably use more showers. I did have to wait a few times because there are only two showers and I noticed a lot of other campers like to take showers at the campground instead of in our campers. We were told to go to Slide Rock by some friends but it isn't dog friendly. We ended up going to Crescent Moon instead - it is only $10 per car and you can bring your dog. If you are traveling with a dog be aware that we did see a skunk running through the campground one night. The town has light restrictions which made viewing the Milky Way at night perfect! We were supposed to stay for one week and once we arrived we knew we had to extend our stay to two weeks! If you enjoy healing crystal stones, we highly recommend the Crystal Magic store over on 89A. We went at least 6 times during our 14 day stay. They are so friendly and knowledgeable about stones, books, incense, jewelry and more! They also loved our dog coming in to shop. Then there are two stores called Crystal Vortex in the downtown Sedona shops and they have a great selection of stones with knowledgeable friendly staff, too. We camped at Rancho Sedona RV Park in a Travel Trailer. There is a Friday morning farmer's market at the Tlaquepaque complex and we really enjoyed it. Creekside has outdoor dining that is dog friendly (and they have a dog menu!) And if you need an oil change the team at Sedona Oil and Lube were all super friendly! Paleo Brio and Tamaliza were yummy, too. This is one of the nicest campgrounds. The sites are level and paved, each site has a tower with electric and cable and internet. The Wifi was great - thankfully - because there is no Verizon service at all. We also have a T-Mobile phone and that phone worked fine. The landscaping is beautiful. The check in desk and store is very nice and the people that work there are friendly. There is a big clubhouse that had a BBQ one night with burgers, drinks and music for a reasonable price. Everyone we met was so friendly and we left with new friends. There is a nice big dog park in the middle with very nice grass. There is a gravel walking loop around the whole campground that we enjoyed. We drove into Taos two different days and we also drove into Red River. Angel Fire was a bit sleepier than we expected and the grocery store was disappointing. The fresh fruits and vegetable section was very limited. The store seemed to focus on alcohol and snacks. We ended up going into Taos for groceries instead. The Walmart in Taos is old and small - it isn't a super store and it doesn't have groceries. But there is a Smiths and an Albertsons and they were large grocery stores with a large selection. If we come back to Angel Fire we will definitely stay here again - we will just arrive with everything we already need in the RV so we don't have to leave this beautiful resort. There is a nice large hot tub and fire pit near the showers. The showers were like a country club locker room - very clean and large and smelled wonderful. We camped at Angel Fire RV Resort in a Travel Trailer. This was a nice campground. It had so many pros and the only con was the Wifi. The campground has Wifi, but it didn't work at all during our stay. We could connect but there was no data. Luckily our T-Mobile and Verizon data was okay and we were able to use that for our work. We met a lot of nice neighbors - good neighbors really make or break your camping experience! Our campsite was on the lake. It was a tight spot but it was worth it to wake up and look out on the lake every morning. We ate outside several times. The trailer was parked on gravel but there was a large concrete pad for our carpet and chairs. There were TONS of hummingbirds - more than I have ever seen before!! There are feeders outside of the office and I enjoyed walking over there to watch the hummingbirds. The staff was very nice and we enjoyed the store. We found this cute fish made out of wood that we hung on our camper's wall and we are so glad we bought it! FYI our Verizon phone worked all throughout town but our T-Mobile phone lost service once we passed the Pagosa Hot Springs heading towards Walmart and Ace Hardware. 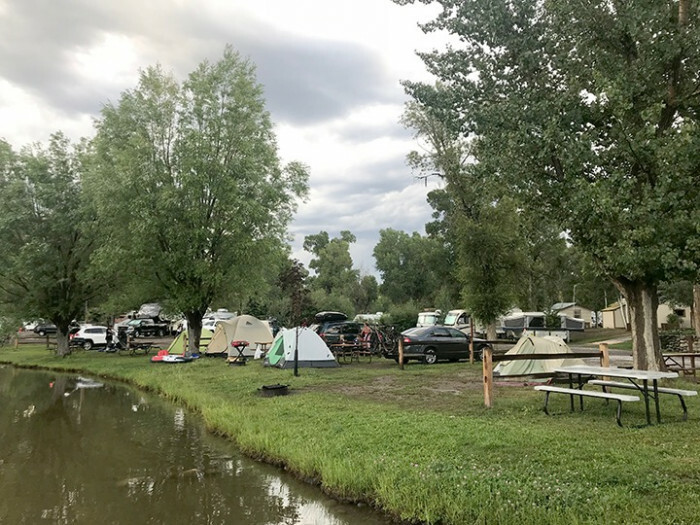 We camped at Pagosa Riverside Campground in a Travel Trailer. We went to the Pagosa Hot Springs one evening - that was such a treat. I highly recommend it.